What did you think of Identifying Reflexive Pronouns Part 1 ? Personal pronouns refer to specific people or things. Each personal pronoun has its own corresponding reflexive pronoun. 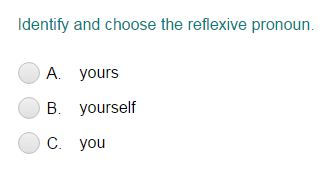 Reflexive pronouns end with –self or -selves.